The Afrolicious O Magazine Cover! 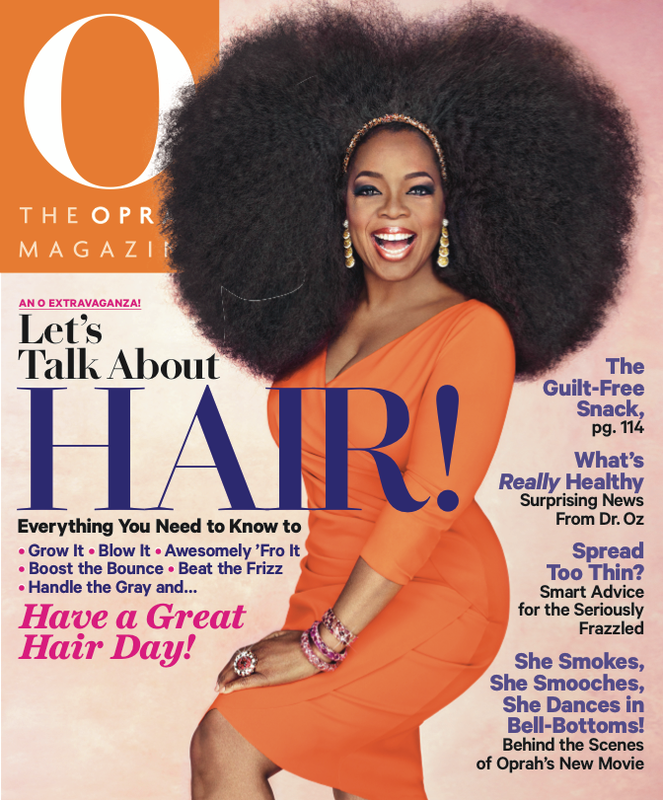 This week, entertainment mogul, Oprah Winfrey unveiled the afrolicious cover of the September issue of her O Magazine. The cover features her rocking a big and beautiful afro, while wearing a tangerine colored, wrap dress and pretty pink and orange jewels. The Oprah.com website revealed that the billionaire's afro wig was 3.5 pounds and designed by celebrity hair stylist, Kim Kimble. Although Winfrey has been known to perm her hair on occasion, her long-time hair stylist, Andre Walker revealed that the entrepreneur has been recently exploring more natural hair styles. "Lately, she's really having fun with more natural looks. She has very little relaxer in her hair now, so we've been exploring her natural texture, twisting or braiding and then setting it free..." (Oprah.com). It sounds like Oprah may be transitioning from permed to natural hair! The title of the cover "An O' Extravaganza: Let's Talk About Hair: Everything You Need to Know to..." reveals that this issue of O'Magazine may be a treat for all. The magazine hits newsstands August, 13th! I will be picking up my copy! Will you be picking up yours?